The Sale of 2,131 properties during the first nine months of 2016 was 14% lower than the 2,481 sold during that same period in 2015. This reverses the trend of the past ten years, that of exceeding each previous January-September period since 2005 when it was 2,337. The nine-month record of 2,818 occurred in 2004 with the low of 913 in 2008. The $589K Average Sale Price (ASP) at the end of September was 16% more than the $508K last year. The $589K for the first nine months of 2016 is a reduction of 27% from the peak of $805K in 2006. The lowest recorded during this century was $273K in 2000. There was virtually no change in the Dollar Value of Sales (DVS) of $1.255 Billion compared to $1.261 Billion for January-September 2015 because of the 16% increase in ASP that was counterbalanced by the 14% decrease in number of sales. The record DVS year occurred in 2005 at $1.8B, the result of an ASP of $788K and 2,337 properties sold. The lowest DVS of $505MM occurred in 2009 with 1,090 sales and an ASP of $463K. The margin between the SP/OLP (91.04%) and SP/FLP (94.63%) is 3.59%. That margin indicates, on average, a seller can anticipate price reductions during the term of the listing of about 3.5% from their 0riginal List Price to the Final List Price prior to receiving a buyer’s offer which would be about 9% less than the Original List Price. The lowest margin between SP/OLP and SP/FLP was 3.1% at the end of Q1 2014; in itself, a significant reduction from the previous low of 7% in 2001 and 2005. The largest variance, 25%, occurred at the end of 2009 when the SP/OLP was the lowest to date, 62.49%, resulting in a record 37.5% difference as the SP/FLP was 12.9%; also a record. The 2,593 Properties For Sale on September 30, 2016 was 17% more than the 2,220 on that date in 2015 and a 49% reduction from the peak of 5,084 in March of 2007. We anticipate the increase in inventory that began in Q3 2015, after nearly 9 years of decreasing inventory, will continue due to current market conditions. The $798K Average Listed Price (ALP) during the first nine months of 2016 is down 3% from $826K at the end of Q3 last year. The ALP peaked at the end of 2007 at $990K, then decreased 30% to $695K by the end of 2012, before increasing by 19% to $828K at the end of 2015. The continuing trend indicated by a rising number of properties listed for sale coupled with a declining number of sales leads us to expect the market to eventually experience decreasing average sale prices. That historic relationship has been countered, however, by an increase in the number of sales and average sale price within the luxury property market of $1M properties, as shown in our Fall/Winter Luxury Island Properties Report. With 14% fewer buyers having 17% more properties to choose among, the trend of fewer sales will continue as there is an immutable relationship between listings and sales: When listings increase, sales decrease, and vice versa. 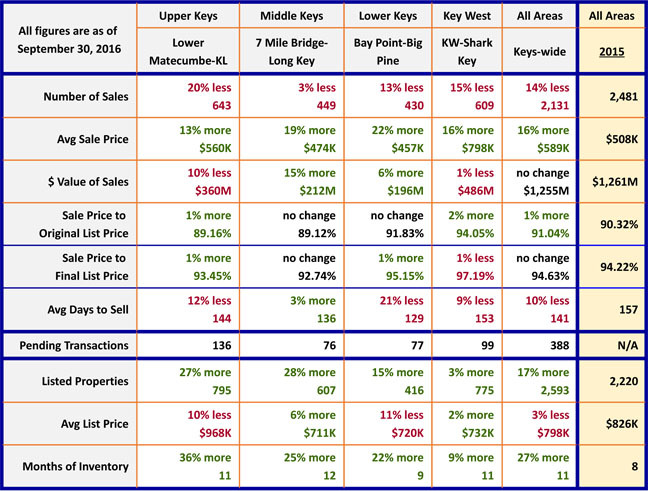 The question remains, “What caused this market slowdown?” First, a large portion of the Keys real estate market consists of vacation home and second home sales. Nationally, that sector is down over 18.5% and the Florida vacation market is down 5% per National Association of Realtors reports released in April of this year. (The next update will be released at the end of October.) Second, the turmoil of the fall elections coupled with general global economic uncertainty appears to have created a cautious attitude regarding discretionary spending on real estate. Many, if not most markets nationwide, are experiencing reduced numbers of sales because of these factors. As noted in the Market Overview, the number of sales for all property types has declined by 14% for the first nine months of 2016 versus 2015 with the Average Sales Price (ASP) increasing by 18% during the same period, which is unusual. 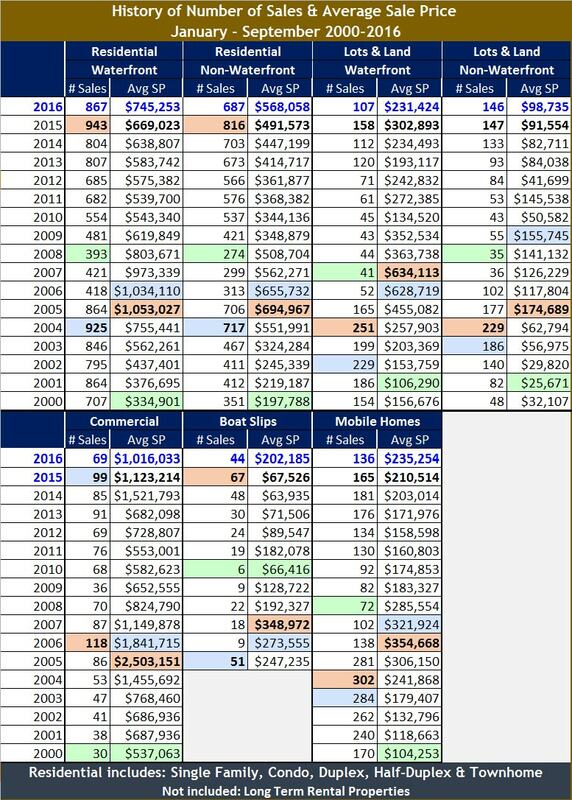 The chart on this page provides readers with perspective concerning the reduced number of sales and the actual change in ASP by property type: Residential Waterfront & Non-Waterfront (Included are single family, condominium, duplex, half duplex and townhouses), Lots & Land Waterfront & Non-Waterfront, Commercial, Boat Slips and Mobile Homes, from January through September 2000-2016. For 2016, the figures for # of Sales and ASP are in blue. The year with the record high for # of Sales & ASP has the cell background in Salmon. The year with the previous high has a light blue background. The year with the lowest number has a light green background. The following is a summary for each property type. Sales: 867 are 8% lower than the record high of 943 set in 2015. ASP: $745K is 11% higher than $669K of 2015. 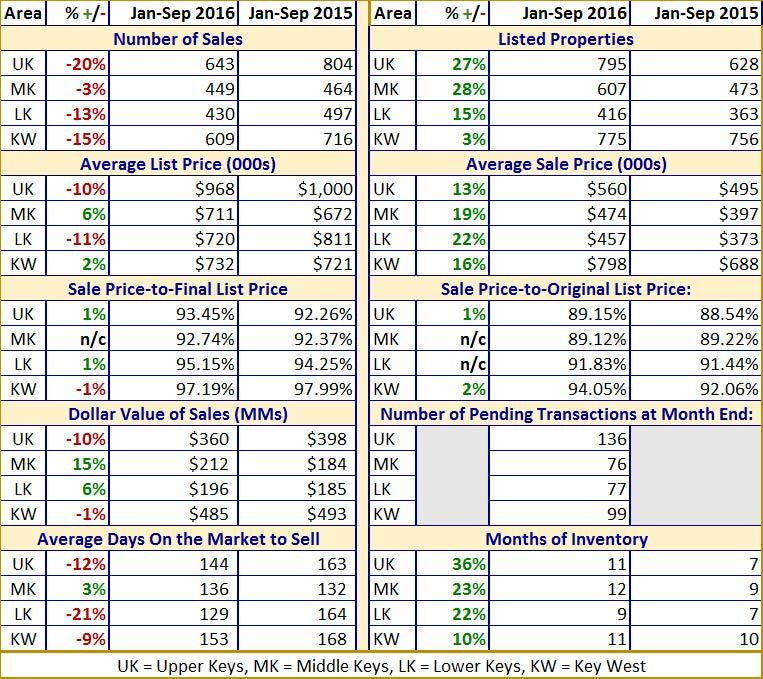 Sales: 687 is 15% lower than the record high of 816 set in 2015. ASP: $568K is 16% higher than $491K of 2015. Sales: 107 is 32% lower than the 158 of 2015. ASP: $231K is 24% lower than the $302K of 2015 and one of the two property types that has experienced a reduction vs. increase in ASP. Sales: 146 matches the 147 of 2015. ASP: $98K is 8% higher than the $91K last year. Sales: 69 is 30% lower than the 99 of 2015. ASP: $1.016M is 9% lower than the $1.123M of 2015 and the only other property type other than Waterfront Lots & Land with a reduction in ASP. Sales: 44 are 34% lower than 67 of 2015. ASP: $202K is 199% higher than the $67K of 2015. Sales: 136 is 18% lower than 165 a year ago. ASP: $235K is 12% higher than $210K of 2015.
contact one of our five offices at the toll free numbers below.